For the last 10 days or so the weather gods have decided that we should not fly. So I've buried myself in work, but made occasional visits to summer-happy downtown Helsinki. 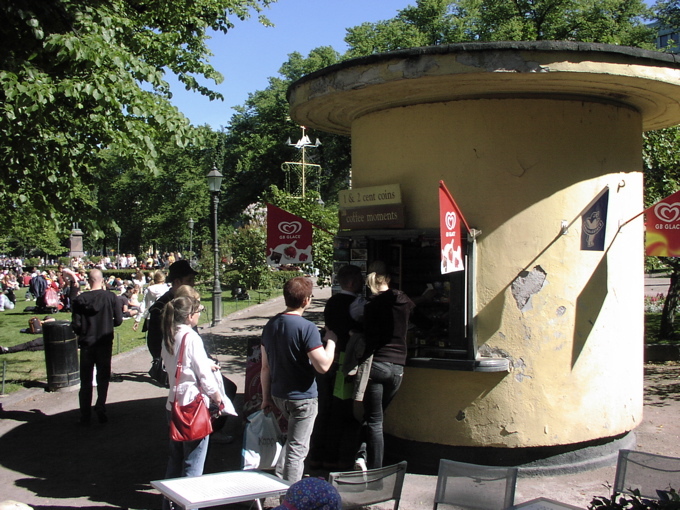 Yesterday went to see an open air jazz concert on the Esplanade and bought myself an ice-cream at one of the classic kiosks. The servant warned about the seagulls but I had no clue what I was in for. Only some 10 meters from the kiosk a couple of seagulls dived onto my ice-cream and by sheer speed knocked the ball of ice-cream from the cone. Right when the ice-cream hit the gravel there were at least 15 gulls and also some other birds. In less then 3 seconds there was nothing left; I couldn't even take out my camera-phone let alone make a picture. One of the many witnesses of the event remarked that "That was some really good ice-cream! ".